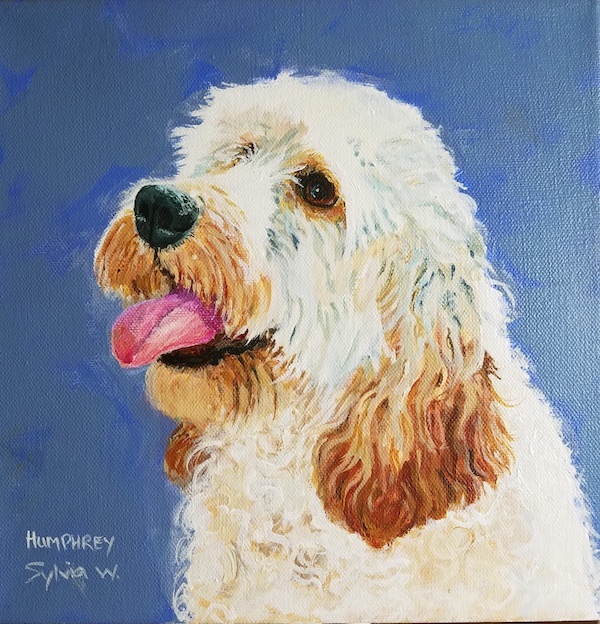 Humphrey is my most recent pet portrait. He is our nephew’s cockapoo. Adorable dog, lots of energy and fun! He was fun to paint with all that curly fluffy fur and floppy ears. This portrait of Rocko was done as a Christmas gift for our daughter-in-law’s sister. It’s such a privilege to be able to create a painting that will preserve a memory for someone who has lost a pet. Pets are such a huge part of our lives and they leave a big hole in our hearts when they are gone. I used a shiny pearl white paint for the background on this one. It gives a very cool effect, but is hard to photograph. I traveled to Oregon last Thursday and got caught up in the road closures and traffic around the Chico area when the Camp Fire was roaring through Paradise. Highway 99 was closed and ash was swirling through the air. A huge pall of black smoke hung over the central valley turning day into night. It was quite frightening just to be under the smoke, I can’t begin to imagine the suffering of the people actually caught up in the fire itself. We looked into retiring in Paradise so I am familiar with the town and surroundings. It was a beautiful community, now so sadly destroyed. My heart goes out to all the people impacted by this horrific fire. I recently took a painting workshop in Grass Valley with artist Denise Wey (http://www.denisewey.com). 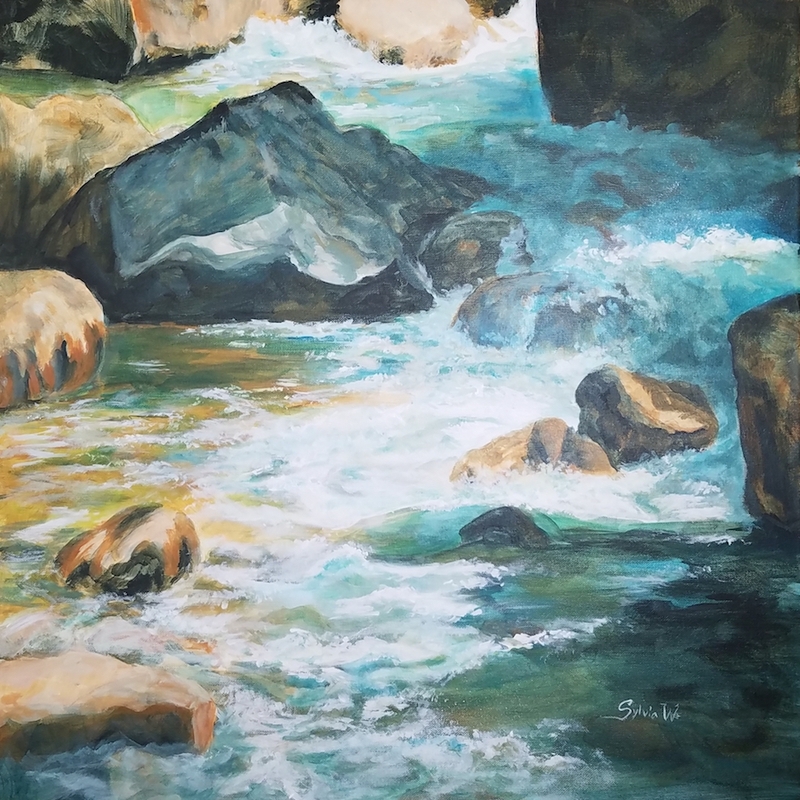 She makes good use of a monochromatic underpainting for her river paintings. Although I have tried this in the past, I have never really used it on a regular basis. I realized in the workshop, that this was the perfect way for me to get over my problems with value. I always struggle getting a good range of values and I find it particularly difficult working in color. For these two paintings I created a monochrome underpainting to the point where I was mostly happy with the values. Then I used thin glazes of color to complete the painting. I used a lot of acrylic matte medium and very little paint. This enables you to sneak up on those values and create wonderful depth. This is especially effective with water - something I have not had much success painting before. 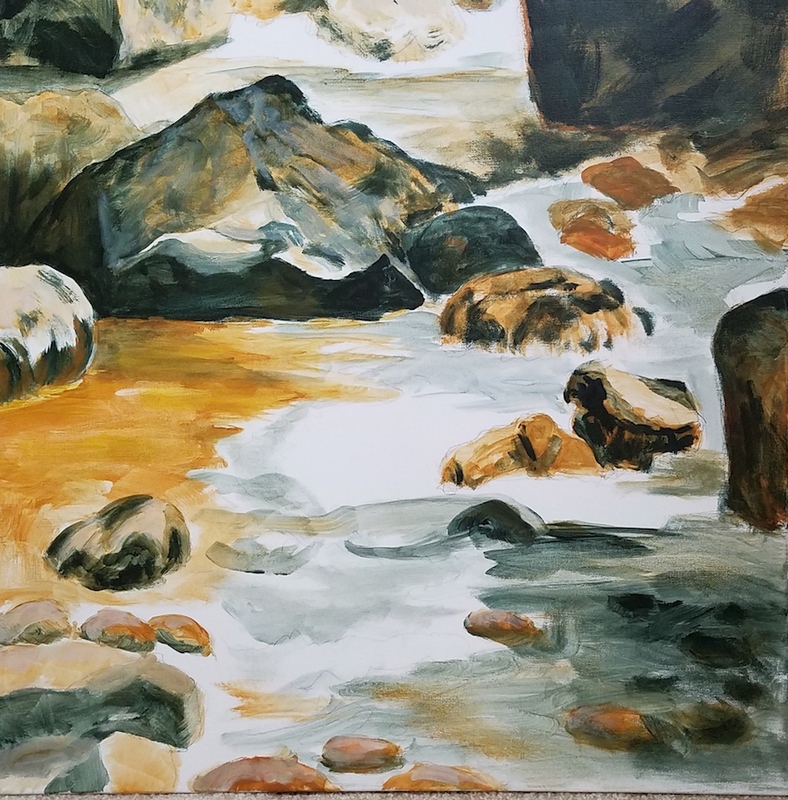 First layers of the Merced River painting. 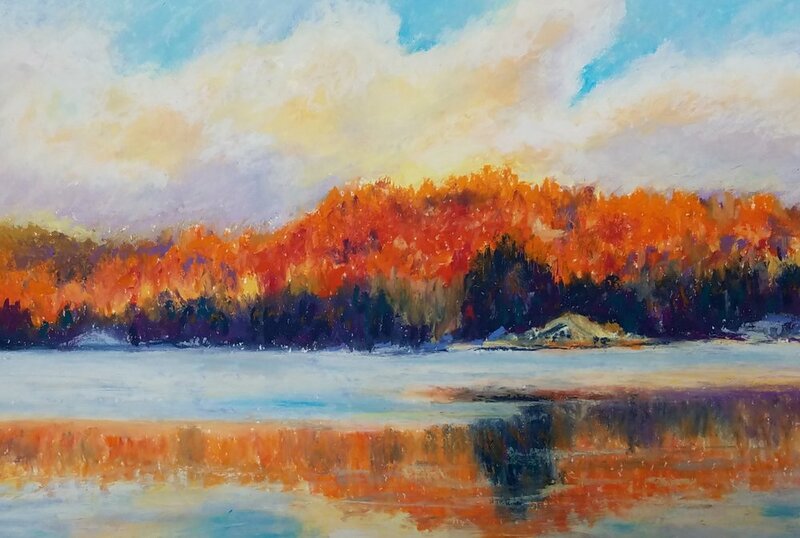 I have been continuing my love affair with oil pastels, exploring the subject of lakes and mountains. I am trying out different sizes and substrates to see which I prefer to work on. So far I am liking heavy drawing paper/light watercolor paper the most, working in 7 x 10 or 10 x 14 inch formats. My larger pieces have been done on illustration board, which seems to take the oil pastel very well, although it takes a lot more work to cover the larger surface (16 x 22 inches)! It's hard to do fine detail in oil pastels, but I have found that drawing with pen before adding the oil pastel is a good way to go. Also if you plan your colors you can use Liquin to dilute oil pastel and create a thin layer which you can then scratch back into to create fine lines. I have been wanting to do a sunset scene for a while and decided it was a good subject for further trials with the oil pastels. This came together really easily and I enjoyed the whole process. I feel like this is a great medium, especially for someone who loves drawing more than painting. It feels very immediate and so much easier than trying to mix paints. I'm very enamored! Of course I still have a lot to learn about the medium and how to do successful layering and color mixing, but so far - so good! This is my initial drawing and start. This piece was done on Illustration board, sealed with acrylic medium. Blocking in the sky. Part of the fun is smushing the pastel around and blending areas. I use my fingers (I wear gloves) and silicone color shapers for blending. I use Myngyo Gallery pastels for most of the painting, with some of the much softer white Sennelier oil pastel for adding light and blending colors. Adding trees and reflections. It was key to get some distance by making the far trees bluer. I have been using oil pastels as a sketching medium prior to painting my pet portraits. They are very helpful tools in choosing and mapping color for a painting. However, I have been so enthralled with them, and the painterly quality that you can get, that I have started doing some more finished pieces using oil pastel. The pieces here are sitting in my studio and I find myself going back to them to add a bit more color, blend something, or scratch into areas. It's a lot of fun! This painting was done from a photo. I am still learning how to apply the oil pastel and smush it around, and how many layers you can actually apply. I bought some Sennelier White oil pastels and these go on top of my harder Mungvo Gallery oil pastels very nicely. I think you could get through the Sennelier oil pastels in a heartbeat tho' as they are so soft and buttery! This painting is done from a sketch (below) and photos. In the early evening from our campsite the sunlight sparkled through the trees. I could see a line of green and a line of blue running behind the trees. I tried to capture the idea in my sketchbook, but it didn't turn out so well. This painting above though I really like. This image is oil pastel on top of a failed watercolor painting. In this one the oil pastel is not blended quite so much and gives a different effect. 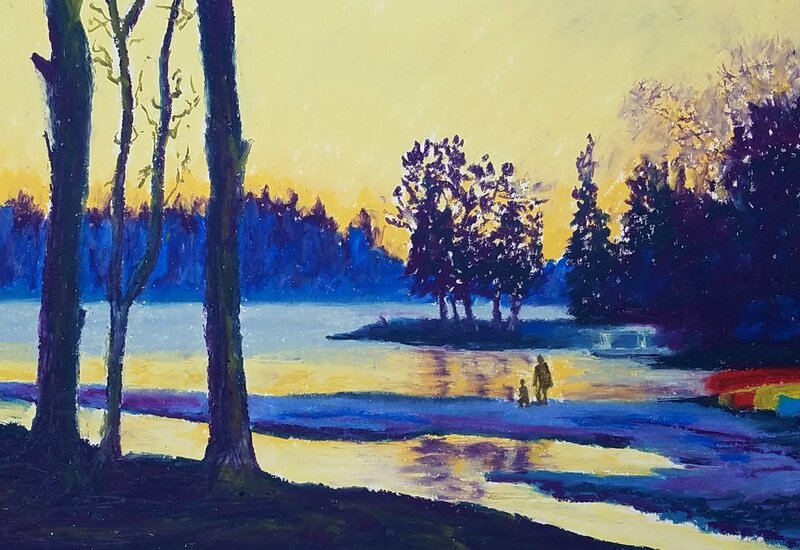 This piece is the second version of a painting of Park #3 at Lake of the Pines. This was done on dark green Mi Tientes pastel paper, which I discovered I didn't like working on. Now I mostly use white drawing paper, or watercolor paper. I just had a wonderful trip to Lake of the Woods, Oregon, courtesy of my dear friend Sue! We managed to do some sketching, kayaking, walking, and singing and playing our ukulele's around the campfire. These are some pages from my sketchbook. I sketched the pebbles just to prove you can make a picture out of anything! I just chose an area on the ground and put some twigs down to "frame" it. The orange stone was a bonus, giving a little pop of color! I started out with some sketches from my photos. Once I had an idea of the format I wanted, I began by roughly sketching the flower heads in place using a pencil. Then I created a background painting by dropping thin watercolor on the paper and letting it run and mingle on the diagonal. I spattered and used clean water to soften edges and move the paint around. I kept in mind where my flowerheads would be. I created several backgrounds, not knowing which one would work out best. After the background was dry, I painted the flowerheads in wet-in-wet, very loosely. Going back into the paint with more pigment as and where I though it was needed, and using clean water to soften edges. I tried to keep it loose and free as much as possible. My flowers are a lot more formed that Jean Haines' would be, but I was very pleased with the end result, and it was such a fun, exciting way to paint. Nevada County Plein Air Painters have a monthly challenge. Last Month's was to copy a painting by master or favorite artist. I chose British Artist Peter Wileman as I love his semi abstract landscapes filled with light and color. He paints in oil and I paint in acrylics, so some aspects of the painting did not come out in the same way. 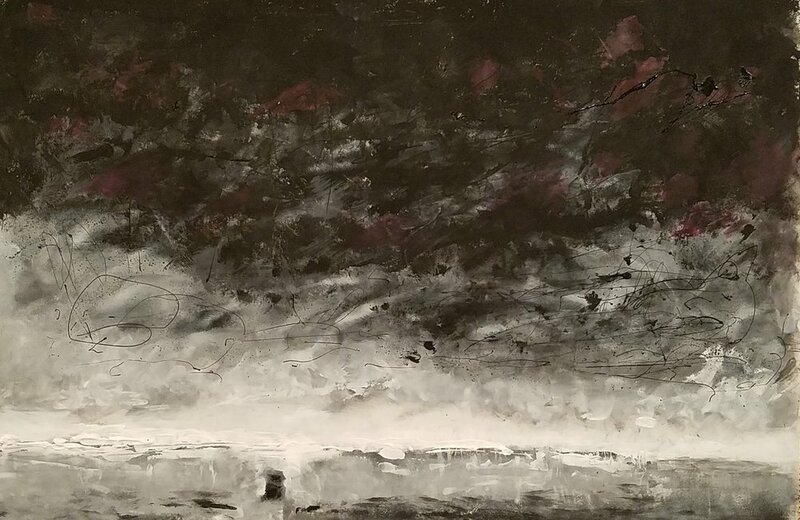 Wileman has some lovely thin layers under his more impasto paint, and he often applies the paint with a painting knife, which I was keen to try. I worked from Wileman's website painting, as opposed to a print. I gridded the screen and my canvas and roughly sketched in the various elements with paint. Then it was on to scumbling thin layers of paint using lots of medium. I started with the mountains and sky, then worked the thin layers in the foreground. It is a fun challenge to try and figure out how an artist created a painting. What colors they used, how they applied the paint, and most importantly what came first. I have copied several masters over the years and always learned a lot - and ultimately ended up with a fabulous painting that I can hang on my wall! I am inspired to try my own attempt at a Wileman style landscape. Just need to sort though my photos and sketches and come up with something suitable...! We just returned from a wonderful trip to England to celebrate my mother-in-law's 90th birthday. While over there I managed a few quick sketches. These are part of the gardens of Littlecote House, a hotel we stayed at. The hotel had parts dating from the 12th century and a wonderful Roman mosaic preserved in the grounds. This is the lovely view from our friends' house on Dartmoor. Dartmoor is subject to wild changes in weather and this sketch was done during a foggy patch where the distant Hound Tor was covered in low cloud. The River Exe Estuary - a lovely peaceful spot to enjoy the view. The tide came in rather quickly! Lyme Regis - famous for its fossils, and the movie "A French Lieutenant's Woman". A long stony beach, with The Cobb off in the distance. Charlie and Alison's Garden. All our family and friends were so hospitable and generous, they made it a wonderful trip. Of course we had to ride some steam trains. This one was on the Severn Valley Railway - but there were others! Keith ran off with the train driver at one point! This is Cosmo. My latest pet portrait. What a darling dog - I had lots of fun painting him! This gorgeous winery is one of many that are a short drive from my new abode. ThIs was painted last Thursday - another beautiful fall day in the foothills. I was with three members of a plein air group from Lincoln. The weather could not have been better and both the vines and the trees had their best colors on. I was able to pick a nice shady spot under some oaks to paint from. Beyond the fall trees is a lovely pond area, which I took photos of, but didn't get to paint. Definitely a great place to go and paint again. These two little watercolors were done for this months challenge for the new art group I joined. The theme was "Leaves" with a 5 x 7 inch size restriction. I painted with this group at an organic garden several months ago and while it was too hot to paint the cabbages at the time, I vowed to paint them one day. These were worked from my photos. I haven't painted for a little while, so it was good to get back into it. Today's challenge was painting a green scene! Out by the pool are a wonderful collection of plants and trees, which is lovely and calming to view. Unfortunately it is a sea of of green. I decided to have a go at painting it as I am normally not patient enough to do lots of foliage. It turned out to be fun and I was quite pleased with the end result. It was delightful just being outside, hearing the birds and watching the butterflies dance around. The baby birds featured in a previous posting have fledged and gone - no more cheeping! This was my first time painting with a group of plein air artists from Lincoln. We met at Lake Natoma, which is at the very southern tip of Folsom Lake. It was a boring scene to begin with, but once people started arriving it soon livened up and before we knew it we had beach goers, kayakers, paddle boarders, sailboats and all sorts to paint! The weather was just about perfect, and we had a nice bit of shade to set up in. Below are some sketches I did that day too. Not only did we have sailboats up by the dam, but we also had a group of model boat enthusiasts right next to us, who provided entertainment by racing their boats in front of us. Quick sketches of the real sailboats. My initial sketch before painting. We have been enjoying our temporary accommodation very much. Out by the swimming pool a bird house hangs in a tree and the baby birds in it keep up a demanding cheeping all day long. The parents must be worn to a frazzle! Frenzied cheeping greets every visit by the parent bird, and even more frenzied cheeping accompanies their departure to get more food! I spent quite a while in the pool today observing them and felt exhausted after 15 minutes (and I was only floating there!) The parents have my sympathy. Today's weather was much more comfortable that recently - only 90 in the shade! The wildlife enjoyed it too, lots of butterflies and dragonflies zipping around. One dragonfly kept dipping into the pool for a drink. So, having moved I'm a newby with a painting group again! It was great that the Nevada City Plein Air group were so welcoming and friendly, I felt at home right away. Plein air starts early up here - 8 am (OMG!) as it gets too hot to be sitting out by around 11 am. This was a beautiful site though, a lovely organic farm with fruit, veggies and flowers abounding. There were lots of bees buzzing around the lavender, and a few birds twittering in the trees, so it was a peaceful scene. This little sketch finished off my handmade sketchbook, so now I need to make another one! Well, the move from our house went well, and we are now ensconced in some lovely temporary accommodation at Auburn Valley Ranch, Auburn CA. Above is today's sketch efforts beside the pool. They also have chickens here, so I sketched them today, and I also drew the ranch hound - Luke, who is a real sweety! 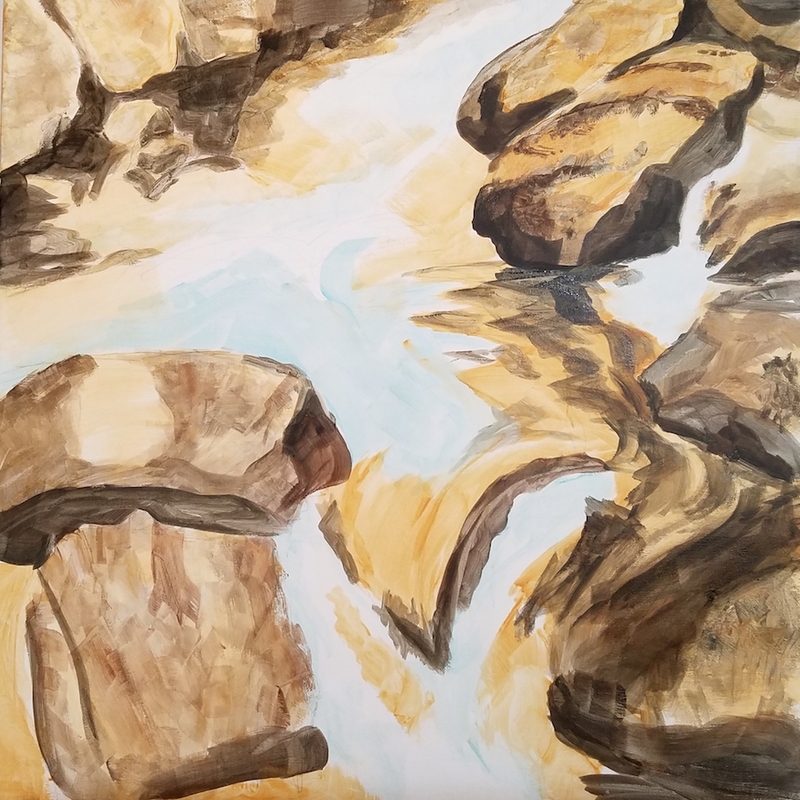 I am going to connect with artists up here and to that end I will be going painting Sunday with the Nevada County plein air painters. In the mean time I have a little companion to give me advice! The paintsites group met at this wonderful park for another hike and sketch this week. This was my last hike and sketch before my move, and it may be a while before I see some of my painting friends again so it was bitter sweet. The hike and sketch events have always been fun though and this was no exception. There was an abundance of wildflowers, including poppies, miniature lupin and the largest swaths of Purple Vetch I have ever seen. This was a view of the cookhouse.